Ask.com (originally known as Ask Jeeves) is a question answering–focused e-business founded in 1996 by Garrett Gruener and David Warthen in Berkeley, California. The original software was implemented by Gary Chevsky from his own design. Warthen, Chevsky, Justin Grant, and others built the early AskJeeves.com website around that core engine. From the mid-2000s, The "Jeeves" name was dropped and focused on the search engine, with its own algorithm. In late 2010, facing insurmountable competition from more popular search engines like Google, the company outsourced its web search technology and returned to its roots as a question and answer site. Douglas Leeds was elevated from president to CEO in 2010. Ask.com has been criticized for its browser toolbar, which has been accused of behaving like malware due to its bundling with other software and the difficulty of its uninstallation. Three venture capital firms, Highland Capital Partners, Institutional Venture Partners, and The RODA Group were early investors. 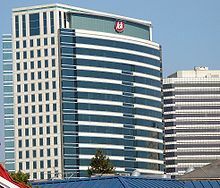 Ask.com is currently owned by InterActiveCorp (IAC) under the NASDAQ symbol NASDAQ: IAC, and its corporate headquarters are located at 555 City Center, in the Oakland City Center development in downtown Oakland, California. Ask.com was originally known as Ask Jeeves, "Jeeves" being the name of a "gentleman's personal gentleman", or valet, fetching answers to any question asked. The character was named after Bertie Wooster's butler character Jeeves, in the fictional works of P. G. Wodehouse. The original idea behind Ask Jeeves was to allow users to get answers to questions posed in everyday, natural language, as well as by traditional keyword searching. The current Ask.com still supports this, with support for math, dictionary, and conversion questions. Ask Jeeves launched in beta in mid-April 1997 and fully launched on June 1, 1997. On September 18, 2001, Ask Jeeves acquired Teoma for over $1.5 million. In July 2005, Ask Jeeves was acquired by IAC. In February 2006, Jeeves was removed from Ask Jeeves and the search engine rebranded to Ask. On June 5, 2007, Ask.com relaunched with a 3D look. On May 16, 2006, Ask implemented a "Binoculars Site Preview" into its search results. On search results pages, the "Binoculars" let searchers have a sneak peek of the page they could visit with a mouse-over activating a pop-up screenshot. In December 2007, Ask released the AskEraser feature, allowing users to opt-out from tracking of search queries and IP and cookie values. They also vowed to erase this data after 18 months if the AskEraser option is not set. HTTP cookies must be enabled for AskEraser to function. An Ask.com search of Wikipedia. On July 4, 2008, Ask acquired Lexico Publishing Group, which owns Dictionary.com, Thesaurus.com, and Reference.com. In August 2008, Ask launched the Ask Kids search engine designed for children. On July 26, 2010, Ask.com released a closed-beta Q&A service. The service was released to the public on July 29, 2010. Ask.com launched its mobile Q&A app for the iPhone in late 2010. Ask.com now reaches 100 million global users per month through its website with more than 2 million downloads of its flagship mobile app. The company has also released additional apps spun out of its Q&A experience, including Ask Around in 2011 and PollRoll in 2012. In 2010, Ask.com abandoned the search industry, with the loss of 130 search engineering jobs, because it could not compete against more popular search engines such as Google. Earlier in the year, Ask had launched a Q&A community for generating answers from real people as opposed to search algorithms then combined this with its question-and–answer repository, utilizing its extensive history of archived query data to search sites that provide answers to questions people have. To avoid a situation in which no answers were available from its own resources, the company outsourced to an unnamed third-party search provider the comprehensive web search matches that it had gathered itself. Formerly the direct sales engine for Ask.com, Ask Sponsored Listings is no longer available, having merged with Sendori, an operating business of IAC, in 2011. Ask Jeeves, Inc. stock traded on the NASDAQ stock exchange from July 1999 to July 2005, under the ticker symbol ASKJ. In July 2005, the ASKJ ticker was retired upon the acquisition by IAC, valuing at US$1.85 billion. In 2012 Ask.com made two acquisitions as part of a larger strategy to offer more content on the Ask.com website. On July 2, 2012, Ask.com purchased content discovery start-up nRelate, for an undisclosed amount. That was followed by the company's acquisition of expert advice and information site About.com, which closed in September 2012. On August 14, 2014, Ask.com acquired popular social networking website ASKfm, where users can ask other users questions, with the option of anonymity. As of August 14, 2014, Ask.fm had 180 million monthly unique users in more than 150 countries around the world, with its largest user base in the United States. Available on the web and as a mobile app, ASKfm generates an estimated 20,000 questions per minute with approximately 45 percent of its mobile monthly active users logging in daily. To date, the mobile app has been downloaded more than 40 million times. The Ask browser toolbar is an extension that can appear as an extra bar added to the browser's window and/or menu. In early versions, it was often unintentionally installed during the installation of partner software, including Oracle Java, i.e., taking advantage of a user's lack of technical experience. As an operating business of IAC, Ask Partner Network had also historically entered into partnerships with some software security vendors, whereby they distributed the toolbar alongside their software. Installer packages for partner companies had an option (opt-out) to install the Ask toolbar and/or change the user's default browser home page to Ask.com. Ask.com and its parent company IAC have therefore been criticized for promoting a toolbar that behaves like malware—that it was surreptitiously bundled with legitimate program installations, e.g., Oracle's Java, that it could not be easily removed from common browsers once installed, that consumers installed the software unwittingly, that the toolbar redefined the user's home page to Ask.com, and that Ask.com presented biased search results. As early toolbar versions could not be easily removed using built-in uninstall features, it was considered a "potentially unwanted program". A further criticism was a ten-minute delay that was built into the installation, between updating Java and appearance of the Ask toolbar. The company defended these early business decisions,[who?][where?] pointing out that instructions to remove the toolbar could be found at the Ask.com Help Center. As of June 2015, Ask.com no longer bundles with Oracle's Java (which now features a Yahoo! toolbar). As of June 2015, Microsoft does not consider the toolbar that is being provided by Ask.com to be unwanted software, but they state that older versions of the toolbar pose "a high threat to your PC", and they provide tools for detecting and removing them. Apostolos Gerasoulis, the co-creator of Ask's Teoma algorithmic search technology, starred in four television advertisements in 2007, extolling the virtues of Ask.com's usefulness for information relevance. A Jeeves balloon appeared in the Macy's Thanksgiving Day Parade through 2000-2004. After a hiatus from mass consumer marketing, Ask returned to TV advertising in the fall of 2011 after refocusing its site on questions and answers. Instead of national advertising, Ask focused on local markets. In the summer of 2012, Ask launched a national cinema campaign, along with other out-of-home tactics in certain markets such as New York and Seattle. As part of a Seattle-based local market effort, Ask.com launched its “You Asked We Answered” campaign in 2012, in which the company “answered” residents' top complaints about living in their city, including easing morning commutes and stadium traffic, as well as keeping the local Parks and Rec department wading pools open. On January 14, 2009, Ask.com became the official sponsor of 2000 NASCAR Sprint Cup Series Champion Bobby Labonte's No. 96 Ford. Ask would become the official search engine of NASCAR. Ask.com was the primary sponsor for the No. 96 for 18 of the first 21 races and had rights to increase this to a total of 29 races that season. The Ask.com car debuted in the 2009 Bud Shootout where it failed to finish the race, but subsequently returned strongly, placing as high as 5th in March 1, 2009 Shelby 427 race at Las Vegas Motor Speedway. Ask.com's foray into NASCAR represented the first instance of its venture into what it calls "Super Verticals". ^ "Ask.com". Bloomberg L.P. Retrieved February 19, 2019. ^ "Ask.com Site Info". Alexa Internet. Retrieved April 2, 2018. ^ a b Ryan, Kevin (November 12, 2010). "The Long, Sad Story of Ask.com". adage.com. Archived from the original on January 15, 2019. Retrieved February 18, 2019. ^ Kopytoff, Verne G. (November 9, 2010). "Ask.com Giving Up Search to Return to Q-and-A Service". The New York Times. ^ "IAC Management". IAC. Archived from the original on January 5, 2012. ^ "Ask Jeeves, Inc. initial public offering prospectus". Archived from the original on June 29, 2011. Retrieved July 12, 2011. ^ a b Engine Report, The Search (August 5, 1997). "Ask Jeeves: Metacrawler With A Twist". Search Engine Watch. Archived from the original on July 6, 1998. Retrieved January 15, 2019. ^ "Teoma - The Superior Search Engine?". www.rustybrick.com. Retrieved January 29, 2019. ^ a b "Short History of Early Search Engines – The History of SEO". www.thehistoryofseo.com. Retrieved February 3, 2019. ^ a b "IAC". www.iac.com. Archived from the original on December 26, 2010. Retrieved February 18, 2019. ^ Major Relaunch For Ask: Ask3D, Techcrunch, June 4, 2007. Retrieved June 5, 2007. ^ Ask.com Takes the Lead on Log Retention; Microsoft and Yahoo! Follow, eff.org. Retrieved January 3, 2008. ^ "Does AskEraser Really Erase?". Electronic Privacy Information Center. Archived from the original on March 8, 2008. Retrieved March 10, 2008. ^ "Letter to U.S. Federal Trade Commission" (PDF). Center for Democracy and Technology. January 23, 2008. Retrieved March 10, 2008. ^ Auchard, Eric (July 3, 2008). "Ask.com closes acquisition of Dictionary.com". Reuters. ^ "Ask.com closes Dictionary.com deal". CNet. July 4, 2008. ^ "Ask.com Q&A Service Drops July 29th". Softpedia. July 27, 2010. ^ Christian, Zibreg (September 24, 2010). "Ask.com has an iPhone app that lets you ask and get local answers". Geek.com. ^ Sterling, Greg. "Ask CEO Doug Leeds Proclaims Search Wars "Over," Says Yahoo Can Be Great Again". Search Engine Land. Retrieved October 16, 2012. ^ Knight, Kristina. "How Tina Fey inspired Ask.com to change". BizReport. Retrieved October 16, 2012. ^ Perez, Marin. "Ask Around app brings location-based conversations to iPhone". Into Mobile. Retrieved October 16, 2012. ^ Spirrison, Brad. "Ask.com hits the polls with Pollroll". Appolicious. Archived from the original on November 28, 2012. Retrieved October 16, 2012. ^ Van Grove, Jennifer. "Ask.com Reinvents Itself with a Focus on Community Q&A". Mashable. Mashable. Retrieved August 27, 2013. ^ Kopytoff, Verne (November 9, 2010). "Ask.com to Return to Old Service". New York Times. New York Times. Retrieved August 27, 2013. ^ "Ask Sponsored Listings is now Sedori". Sendori. Retrieved October 29, 2012. ^ de Senerpont Domis, Olaf. "Q&A with Ask.com's CEO and nRelate's Founder". The Deal Pipeline. Archived from the original on July 10, 2012. Retrieved October 23, 2012. ^ Stewart, Christopher. "Times Co. Sells About.com for $300 Million". Wall Street Journal. Retrieved October 23, 2012. ^ Magid, Larry. "IAC's Ask.com Buys Ask.fm And Hires A Safety Officer To Stem Bullying". Forbes. Forbes. Retrieved August 29, 2014. ^ Curtis, Sophie. "Tinder owner buys social network ASKfm". The Telegraph. The Telegraph. Retrieved August 29, 2014. ^ Sullivan, Laurie. "Ask.com Acquires Q&A Social Network Ask.fm, Prepares To Add Tools To Increase Safety". Media Post. Media Post. Retrieved August 29, 2014. ^ a b Perez, Sarah. "IAC Agrees To Work With Regulators On Cyberbullying Protections Following ASKfm Deal". Techcrunch. Techcrunch. Retrieved August 29, 2014. ^ a b Bott, Ed (January 22, 2013). "A Close Look at How Oracle Installs Deceptive Software with Java Updates" (online). ZD Net. CBS Interactive. Retrieved January 1, 2016. Oracle's Java plugin for browsers is a notoriously insecure product. Over the past 18 months, the company has released 11 updates, six of them containing critical security fixes. With each update, Java actively tries to install unwanted software. Here's what it does, and why it has to stop… IAC, which partners with Oracle to deliver the Ask toolbar, uses deceptive techniques to install its software...The Ask.com search page delivers inferior search results and uses misleading and possibly illegal techniques to deceive visitors into clicking paid ads instead of organic search results. ^ "Ask Partner Network". Retrieved November 20, 2012. ^ "Ask Help Center". Retrieved May 5, 2016. ^ Heddings, Lowell (February 19, 2013). "The Shameful Saga of Uninstalling the Terrible Ask Toolbar" (online). How-To Geek. Retrieved January 1, 2016. If you managed to get infected with the absolutely terrible Ask Toolbar on your computer, don’t be ashamed – it could happen to anybody. Especially considering that is bundled with the equally awful Java runtime. Those people should be ashamed of themselves. ^ "PC Magazine: How to Remove the Ask.com Toolbar From Your Browser". uk.pcmag.com. Retrieved June 13, 2015. ^ Rashid, Fahmida. "How to remove the Ask.com Toolbar from your browser". PCmag. Ziff Davis. Retrieved January 8, 2014. ^ McKirdy, Eric. "Ask.com Help Center". Ask.com. Ask.com. Archived from the original on September 3, 2014. Retrieved August 29, 2014. ^ Keizer, Gregg (June 12, 2015). "Microsoft deletes older Ask.com browser toolbars, but ignores Oracle's new crapware" (online). Computer World. Computerworld.com. Retrieved August 3, 2015. Microsoft took what appeared to be a shot at Oracle's wallet this month when it switched on search-and-destroy in its security software for older versions of the Ask browser toolbar, which has long been bundled with Java even in the face of users' complaints. ^ "Microsoft's good deed for the day: browser-hijacking Ask Toolbar gets the banhammer on Windows". ^ "Microsoft Malware Protection Center - BrowserModifier:Win32/AskToolbarNotifier". microsoft.com. Archived from the original on June 11, 2015. Retrieved June 11, 2015. ^ "About Ask.com: TV Spots". Archived from the original on April 10, 2007. Retrieved April 25, 2007. ^ Ha, Anthony. "Ask.com Returns to TV, Cautiously". AdWeek. Retrieved November 12, 2012. ^ Vega, Tanzina. "Ask.com Heralds a New Focus". New York Times. Retrieved November 12, 2012. ^ Sandoval, Greg. "Hey, Times Square! I'm Google+. Please Notice Me". CNET. Retrieved November 12, 2012. ^ Sullivan, Laurie. "Ask.com Launches 'You Asked' Branding Campaign". Media Post. Retrieved November 12, 2012. ^ Official Release (January 14, 2009). "– Ask.com enters NASCAR with multi-faceted program". Nascar.com. Archived from the original on June 28, 2011. Retrieved July 12, 2011. ^ Duane Cross. "Labonte will drive No. 96 for Hall of Fame in 2009 – 14 January 2009". Bbs.cid.cn.nascar.com. Archived from the original on 14 July 2011. Retrieved 12 July 2011. ^ "Ask.com Partners With NASCAR, Says "Super Verticals" Will Put It Back In Search Race". Searchengineland.com. January 13, 2009. Retrieved July 12, 2011.